The countdown is on - 19 days until Christmas break. Don't think your child's teacher doesn't already have that on a pad of sticky notes on her desk and is tearing one off each day that goes by. Half the school year is over and it's time to show your child's teacher a little appreciation for all the hard work she's done so far. 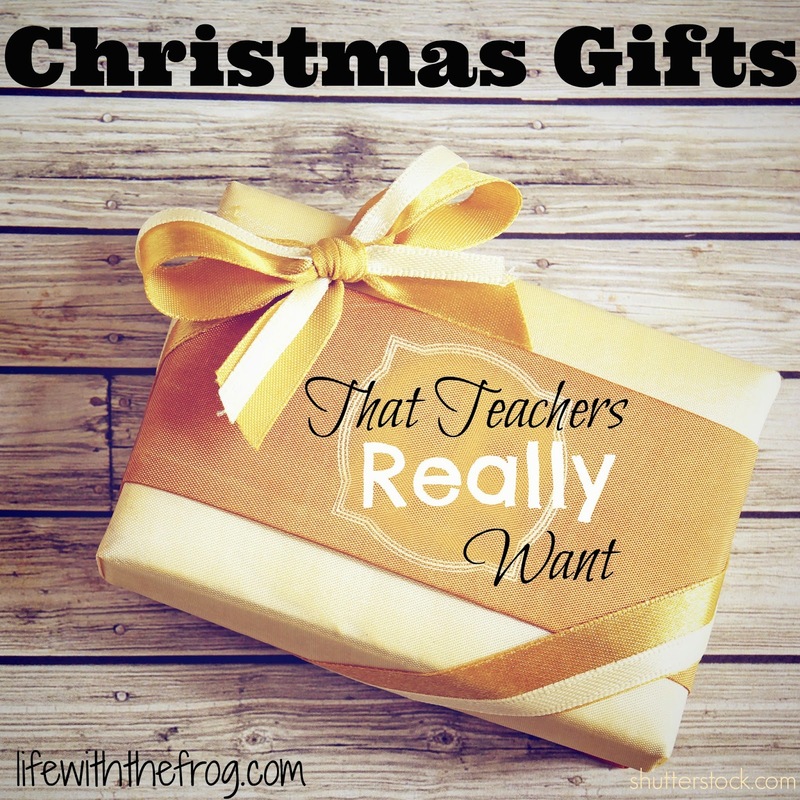 I've polled some teachers I know and used my past classroom teaching experience to come up with some useful and creative gift ideas for teachers. apple-themed anything - Because, really, they have enough of that stuff. Really. coffee mugs - Yep, they have enough of those, too (and some teachers don't even drink coffee!). coffee mugs with apples on them - Do I really have to explain this one? Studio Oh! Thank You notecard set. 1. Stationary: Several of the teachers I asked said they like to receive blank thank you note cards and pretty stationary as gifts. Most still hand write thank you notes to parents and students. I thought these whimsical ones from Studio Oh! would make a cute gift for my son's preschool teacher. Notepads were also mentioned by teachers as useful gifts since they are always making lists and jotting things down. This pack of 12 magnetic memo pads with monthly themes will have them in paper all year long and look cute stuck to the side of their filing cabinet just where it's needed. Of course, you could always buy a pack of regular 'ole Post-It notes and find a creative way to give them to the teacher. This Pin shows a cute DIY way - just use holiday paper and you're good to go. In fact, a search of Pinterest shows lots of ways you can dress up plain Post-Its, if you're crafty and have the time. 2. And while we're on the subject, School Supplies: Oh, I know teachers can get pens and pencils from the district office, but sometimes it's nice to have cute or interesting supplies to use with the kids or just something fun for them to use during their work day. If these Harry Potter pens had been around when I was teaching, they would have made a great gift for me. I spied some cute Peanuts Snoopy Way To Go Pencils with Toppers - 36 per Pack that I might have to get for Lil' C's teacher. It's rumored that she loves Snoopy, and this would be a fun way for her to reward her class. I think the key is knowing a little bit about the teacher and what he or she likes, then being creative. 3. Almost all the teachers I asked mentioned Gift Cards. I have a friend who hates gift cards. She thinks they are too impersonal. I totally disagree. I think as long as you put a little thought into where to get the gift card (Victoria's Secret? Probably totally inappropriate for your child's teacher. Starbucks for a Diet Coke lover? Nope. ), you've given a great and really useful gift. Your local teacher supply store, Target, Wal-Mart, Office Max or Office Depot, or Michael's are great places to start. Of course, if you know the teacher does love her morning cup of Joe, you can always get a Starbucks card. iTunes and Amazon are also sure bets, as teachers can search for specific items or download learning apps for the classroom. This Pin shows a cute way to present gift cards to the teacher. 4. Books and learning activities: Many schools hold a Book Fair in late fall. Find out what is on the teacher's wish list and purchase that book. Go to Scholastic's website and order books that are geared for that grade level or purchase games from their on-line store. Be on the look out for books or activities that go along with the curriculum of the grade she teaches. Want to get something she can read for the holidays? Check out my list of favorite Christmas books. Something like these write and wipe fact family cards can be used over and over.A classroom can never have enough hands-on learning activities. Or get creative and fun (because you know you want your child's education to be) with these answer buzzers - perfect for classroom test reviews (maybe just slip a bottle of ibuprofen in with them, too). 5. Music: This year, Slim's fifth grade teacher plays music while the students have study hall at the end of the day. That iTunes gift card would sure be handy for her. Maybe she could get the latest Kidz Bop 26 CD? Depending on the age of the students, this is a fun and appropriate gift. I've heard Slim singing along to the radio more than once. You could also get her a CD of classical music to play in her class, especially during test preparation time. Some studies have shown that listening to classical music while studying can increase your overall memory and boost intelligence. Even if the "Mozart Effect" is actually bunk, it couldn't hurt to play calm, soothing music at the end of the day, right? I personally have and enjoy The 50 Greatest Pieces of Classical Music . It's never too early to start kids' enjoyment of the classics. 6. Food: I'm not talking about anything homemade here unless you are a professional baker or chef. Food from students' homes can be a little iffy for teachers. I had siblings from a very sweet little family in my class a couple years in a row, and their mom always brought me homemade bread. I feel horrible admitting this, but it went into the trash after school. Their house was constantly battling lice and fleas and I couldn't even . . . One teacher told me that it's nice to be able to bring something home to share with her family. One year, I got several fun and tasty gifts for the teachers from Trader Joe's. I didn't spend a lot, and I made a cute little basket for each of the teachers. I even included things like soaps and candles that this teacher told me she would never buy for herself because money on a teacher salary is often tight. 7. DIY gifts: Here's another confession: Over a decade after leaving the classroom, I still have ornaments and holiday decorations that were made by my students and their families that I put up every year (much to Hubby's chagrin). I wrote the student's name and year on the back, and looking at them really brings back some nice memories. Here are 10 Holiday Gifts that Students Can Make, collected by We Are Teachers. Even a search of DIY teacher gifts on Pinterest makes me want to get out my hot glue gun (if I had one). Other ideas mentioned were jewelry and plants. It really does depend on your interpretation of the teacher's taste and your budget. One thing all of my sons' teachers will be getting this year is a copy of Chicken Soup for the Soul: Find Your Inner Strength, the latest anthology whose pages I'm gracing (*shameless plug*). Teaching takes a lot of strength most days, so I'm hoping the teachers find inspiration within the stories. I might pair it with some wine bubble bath or bath salts, just so they can relax. Also, don't forget some of the other teachers who work with your children, like music, art, and PE teachers, special educators, speech therapists, occupational and physical therapists, and teacher assistants. One of these "special" teachers responded to my question by saying he'd love anything a student gave to him, mentioning that it's just nice to be remembered and appreciated. Last year, I gave all of the teacher assistants a "winter rescue kit" that contained a lip balm, a small hand lotion, and a $5 Starbucks card. Since they direct traffic during the freezing cold morning hours, I thought it was appropriate. Each kit was under $10. You could buy and break up a Burt's Bees Lip Balm, Superfruit Pack, 4 Count and give one to each teacher assistant or special teacher. Package them creatively like these Pins show, and you've got a darling and inexpensive gift. I hope you've found some useful ideas as you start your holiday shopping this weekend. Remember, you don't have to spend a fortune - or even any money at all - on your child's teacher. Even a handwritten note of appreciation will warm her heart and mean a lot. Tell us below, do you have a creative teacher gift idea? If you are a teacher, what was your favorite gift you've ever gotten?